Over the past few years, I’ve been heartbroken to observe the turning away from faith by a few of my nieces and nephews. Although they were raised in Christian homes and stem from a strong faith heritage (my father has been a full-time pastor since 1966), they have, for all intents and purposes, rejected God. How does something like this happen? Why would a young man or woman—who was raised by Christian parents and grandparents; who was taught about God from a young age; who “invited Jesus into his/her heart” early in life; who knows how to pray; who has served when asked—turn his or her heart away from God and towards a worldview in total opposition to Him? Based on well-documented research about the millennial generation and years of personal experience working with this age group, the authors present an excellent overview of what makes millennials tick, how they view the world, what it is they are seeking, and how to help them become rooted in Christ. Their insights are extremely valuable and relevant; their solutions, doable. Following the model Jesus set forth in Matthew 7:3-5, the authors challenge their readers to first “take the plank out of your own eye, and then you will see clearly to remove the speck from your brother’s eye.” In other words, with compassion and boldness, they encourage their readers to first look at their own spiritual lives before that of their children. We must remember that as parents, we have a LIFELONG role in shaping our children’s perception of God and what it means to be a Christian—this doesn’t stop when they turn eighteen. Once we’ve looked within, confessed our sins, and gotten our own lives right with the Lord, we are in a better position to understand what is going on with our children. Out of the seven key reasons for faith abandonment common among millennial Christians, the first reason will probably come as a surprise to some of my readers, but it’s true. Activity does NOT not equal relationship. What they have discovered is that young adults who lack deep, relational roots in the faith will fall away when confronted with questions they are unprepared to answer. Remember the parable of the sower. Not everything that sprouts thrives. Offering both hope and explanation, this section focuses on the roles of society, parents, and the church in the lives of millennials. This section paints an excellent picture of who millennials are, what drives them, and how much we need them in our lives and organizations. With practical tips for helping to sustain and/or rebuild parent/adult-child relationships, this section will help the parent (or boss) understand how to relate to young adults. Here’s where the rubber meets the road. Practical tools include a prayer map for your millennial as well as instructions for building a foundation of biblical truth. This bonus section gives step-by-step instructions to help parents help their millennials move out on their own and enjoy a life of independence. 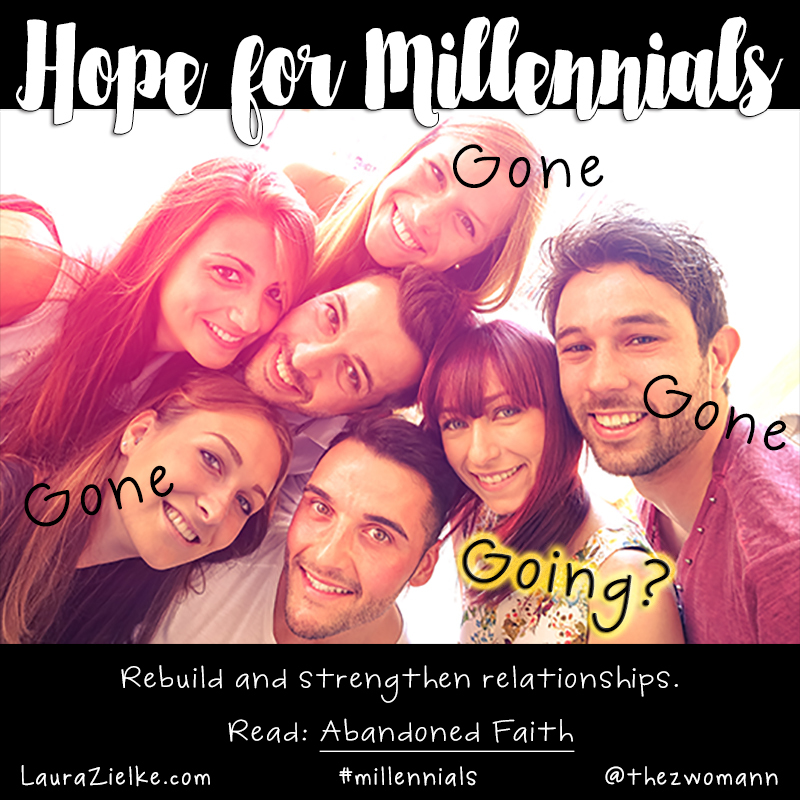 Whether or not they have walked away from the faith, if you have millennial children or grandchildren (or maybe they are post-millennial, like mine), you will benefit from reading Abandoned Faith. By the time you finish it, not only will you have a better understanding of millennials in general, you’ll also have a more clear picture of the millennial(s) in your own life. You will have more insight into the ways we, as parents, have exacerbated the problem and how we might contribute to the solution. Abandoned Faith will help you become more transparent with your kids about your own faith journey, struggles, and victories. This type of authenticity strengthens the parent-child bond and could potentially help your child come to (or return to) a fulfilling relationship with Jesus Christ. McFarland and Jimenez remind us that God has not given up on this generation, and neither should we. The LORD continues to reach out in love to ALL who call on His Name. I highly recommend Abandoned Faith to anyone in a parental or work relationship with millennials. My hope is that pastors, ministers, young adult workers, grandparents of millennials, and anyone else interested in reaching this generation for the Lord will make an investment in this book and read it from cover to cover. By understanding ways the church has failed this generation, readers will be empowered to change course and make necessary changes before it’s too late. 1 Wikipedia contributors, “Millennials,” Wikipedia, The Free Encyclopedia, https://en.wikipedia.org/w/index.php?title=Millennials&oldid=773009995(accessed April 1, 2017).